Overhaul projects require careful planning and execution. Large scale equipment, such as gas turbines, generators, compressors and large pumps, requires specialist knowledge and expertise to maintain optimum performance. Increasingly, plant owners are looking to outsource the major elements of equipment maintenance in order to improve reliability and minimize downtime. Plant maintenance is a highly skilled operation that requires considerable resources for unexpected repairs and long-term planning for preventative maintenance programmemes. Time is money and plant owners the world over aim to maximize productivity and minimize costs; central to this objective is avoiding unexpected breakdowns which can incur huge costs in terms of lost production. Implementing a robust preventative maintenance programme is the first of many actions that can be taken to reduce the incidence of failure. Depending on the equipment, a number of techniques, such as vibration analysis, thermal imaging, flow measurement and power consumption, can be used to indicate the initial stages of a concern. Recording this data also builds up a useful asset history which can be used to predict failures and enable intervention that minimizes repair times. In many cases this low-level monitoring will be carried out by the on-site engineers, while the data analysis may be conducted by an original equipment manufacturer (OEM) or similar product specialist, such as Sulzer. Once there is an indication that a repair is required, or a piece of equipment is scheduled for a predetermined overhaul, the aim is to implement a strategy that will minimize disruption and return the plant to normal operation as soon as possible. Optimizing this process requires considerable planning, both in terms of manpower and spare parts. Specialist maintenance contractors can provide expert advice and practical assistance in preparing for a major plant service. Experience in these projects is essential to ensure the overhaul runs smoothly and on-site management can also be supplied in addition to the technical support. In some cases, such as large gas turbines, the OEM may initially have a fixed contract to deliver a long-term service agreement (LTSA). However, once this has expired, the plant owner is free to continue with a similar arrangement or to engage an independent provider. In many cases, the independent option is more attractive, especially in terms of response time and parts repairs which can be critical in returning the asset back to normal operation. With such high-value assets, it is common for plant owners to maintain a stock of spare components, either on their own premises or stored and managed by the independent maintenance partner. For example, spare rotors for compressors are usually held so that when a planned maintenance shutdown is carried out, the service rotor can be swapped out for the spare, minimizing downtime for the plant. 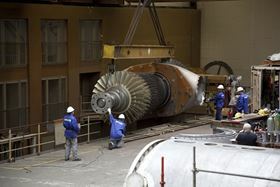 Once the compressor has been recommissioned, the task of inspecting and repairing the rotor that was removed can be carried out. Again, the plant operator has a selection of providers to choose from and the scale of service will differ between them; some will provide a standard repair of damaged components, while others will offer the opportunity to improve performance and efficiency through improvements to the original design. The level of technical expertise also influences the ability of a maintenance provider to support a customer in the event of an unexpected failure or forced outage. These events are a worst-case scenario for a plant manager and it is essential that repairs are completed as quickly as possible. In order to achieve this, maintenance providers need to be able to deliver manpower and facilities at short notice. Long term maintenance contracts offer several advantages and can be tailored to suit each customer. From basic planning and project management, parts supply and repair, to complete technical support including asset improvement and life extension, the level of support can be adapted to each set of circumstances. For those taking advantage of these contracts, they can provide a fixed budget for many aspects of the maintenance contract and improve maintenance strategy. Furthermore, the level of engineering expertise and facilities will reduce maintenance periods and minimize time lost for repairs. Asset management plays a crucial role in determining the reliability and performance of any industrial process. In many cases, engaging an experienced and well-resourced maintenance partner, such as Sulzer, can improve project management, make repairs more cost effective and improve productivity while also providing a fixed cost basis that helps with budgeting. The HST 30 offers near-silent operation and efficient air compression.